Analicia Cube, Doron Comerchero, Deutron Kebebew and Cliff Hodges think outside of the box to better the community. Here’s how. It’s fitting that this week our progressive networking group that seeks to encourage and connect new generations of local leaders, Santa Cruz NEXT, is doling out its 2011 NEXTie awards to four locals who not only think big, they’ve put their big ideas into big actions. 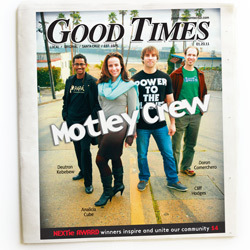 Read the full story at Good Times!